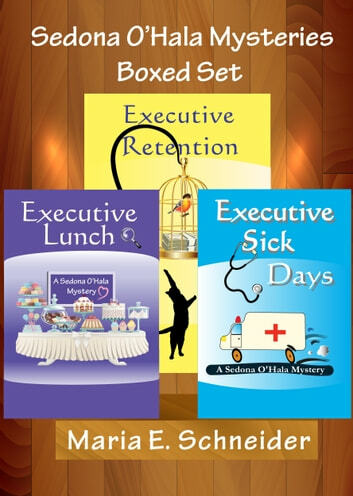 The Sedona O'Hala Mysteries Box Set contains the first three novels in the series: Executive Lunch, Executive Retention and Executive Sick Days. Sedona has more than her share of family problems, career challenges and mysteries to be solved. Sedona is given the opportunity of a lifetime: play an up-and-coming executive with all the trappings of wealth with someone else footing the bill. The catch: find out who is stealing company funds before the criminals find out that their program is being debugged. Sedona runs into danger, the corporate glass ceiling, and an occasional chance at romance in her quest. Steve Huntington has a way of offering jobs that are too good to be true. Mark Huntington makes offers too good to turn down. Sedona has a habit of being caught in the middle; somewhere in the proximity of bad guys with guns and family members she is trying to avoid. Good thing the latest case involves a hospital. Then again, not all hospital personnel are interested in the lasting health of the patients...or that of their co-workers. 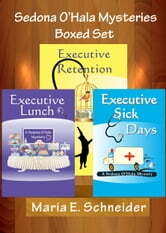 I love the Executive series. Maria Schneider is a wonderful author. There is one scene in Executive Lunch that is my most favorite scene in any cozy I have ever read. No need for spoilers, you'll know it when you read it. Ms Schneider's books are well plotted and paced to hold your interest from beginning to end. If you like cozies, give this series a try. And even better, Ms Schneider does not limit herself to a single genre. She has written wonderful UF, paranormal, dragons, and a couple others whose genre escapes me. But the wonderful writing shows through no matter what the genre. I discovered Maria Schneider with Executive Lunch. I've since read everything else by her that I can get my hands on. I've enjoyed every single one. So if cozy mysteries are your genre, or even if they're not, give this series a try. My guess is that you will like it.